“The Art of Social Media: Power Tips for Power Users” by Guy Kawasaki and Peg Fitzpatrick has just been released by Penguin Group (USA) LLC. But there’s no one quite like Kawasaki, the legendary former chief evangelist for Apple and one of the pioneers of business blogging, tweeting, Facebooking, Tumbling, and much more. 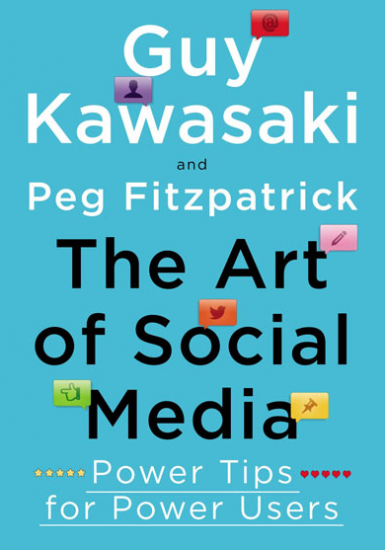 Now he has teamed up with Fitzpatrick, who he says is the best social-media person he’s ever met, to offer “The Art of Social Media” — the one essential guide you need to get the most bang for your time, effort, and money. With over 100 practical tips, tricks, and insights, the authors present a bottom-up strategy to produce a focused, thorough, and compelling presence on the most popular social-media platforms. They guide you through steps to build your foundation, amass your digital assets, optimize your profile, attract more followers, and effectively integrate social media and blogging. Fitzpatrick is a social media strategist and popular blogger writing on her own website and across the web. She has spearheaded successful social-media campaigns for Motorola, Audi, Google, and Virgin as well as having been a brand ambassador for Kimpton Hotels. “The Art of Social Media” is her first book. For more information or to purchase the book, visit http://artof.social/. The website includes the Social Media Aptitude and Readiness Test (SMART).